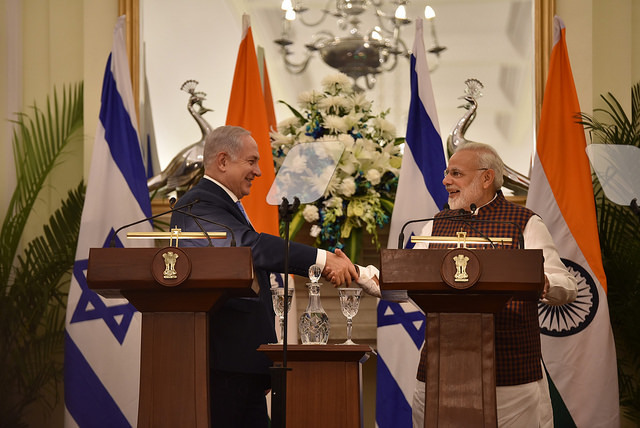 India-Israel relations moved onto a higher trajectory on a crisp wintry afternoon in Delhi as the two countries signed nine pacts in diverse areas and their leaders speaking in one voice about scaling this vital partnership to new heights. Hailing it as a historic moment in the relationship between India and Israel, India’s Prime Minister Narendra Modi and Israeli Prime Minister Benjamin Netanyahu renewed their shared commitment in taking their multi-faceted partnership to a wholly different level by fusing Israel’s technological prowess and innovation with India’s skills and ingenuity. :Israel Prime Minister Benjamin Netanyahu’s visit to India in January 2018, the first visit by an Israeli PM to New Delhi in over a decade, is expected to galvanise development and agricultural cooperation between the two countries. In a defining step, India and Israel forged “Strategic Partnership in Water and Agriculture” during Prime Minister Narendra Modi’s landmark visit to Israel in July this year. India and Israel also signed two pacts to enhance cooperation on water conservation and state water utility reform in India, and another agreement on agricultural cooperation. 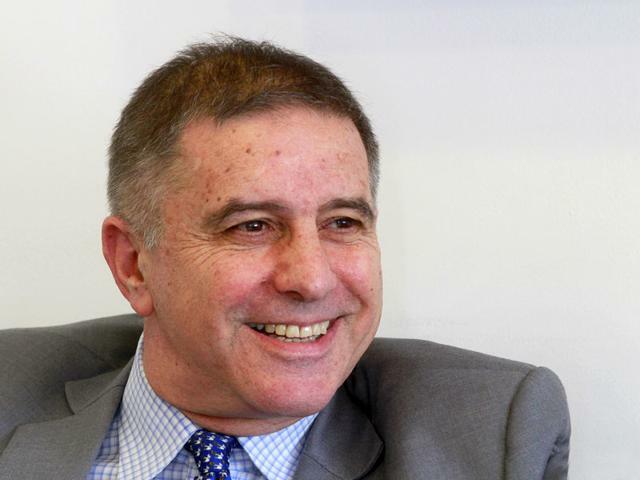 MASHAV, the Hebrew acronym for Israel’s Agency for International Development Cooperation, will shepherd this strategic partnership in years to come. Manish Chand caught up with Ambassador Gil Haskel, the head of MASHAV, in Jerusalem to discuss the way ahead for India-Israel development partnership. In this interview, Amb. 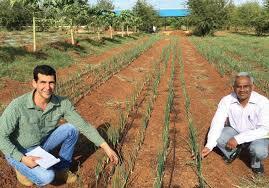 Haskel outlines plans for harnessing Israeli technology to make Indian agriculture less dependent on the vagaries of climate, and to stimulate a new green revolution in India. 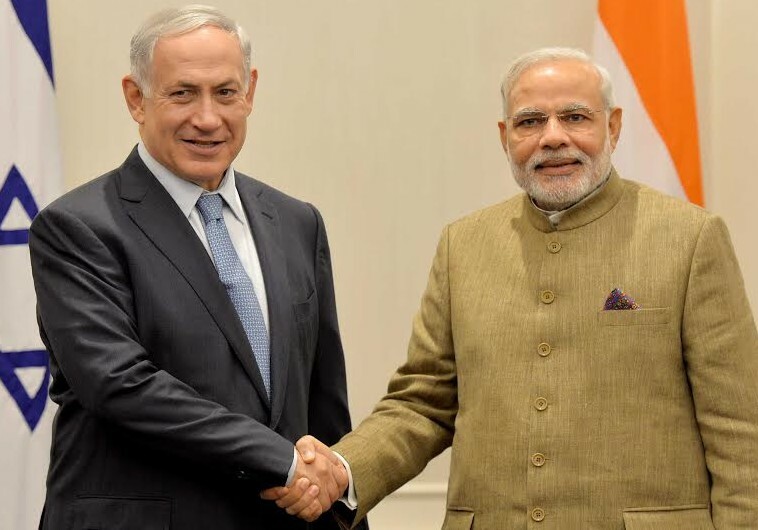 “A marriage made in heaven, which is now being implemented on earth,” this is how Israel’s Prime Minister Benjamin Netanyahu evocatively described India-Israel relations as the two countries elevated their relations to the level of strategic partnership and signed seven pacts in key areas, including agriculture, space and development cooperation. It was clearly not just inspired rhetoric as the outcomes that emanated from over two hours of talks between the two leaders and their delegations were pragmatic and action-oriented, which would have transformative impact on the lives and fortunes of people in the two countries. If Indian talent and Israeli technology are married and fused, along with fostering of deep civilizational and people-to-people bonding, this “marriage made in heaven” could bear new flowers and fruits in days to come, imparting more content and depth to the newly-forged strategic partnership. It was a veritable feast of camaraderie, heart-felt compliments, hugs and handshakes as Israeli Prime Minister Benjamin Netanyahu and India’s Prime Minister showered eulogies on each other and the blossoming India-Israel relations. 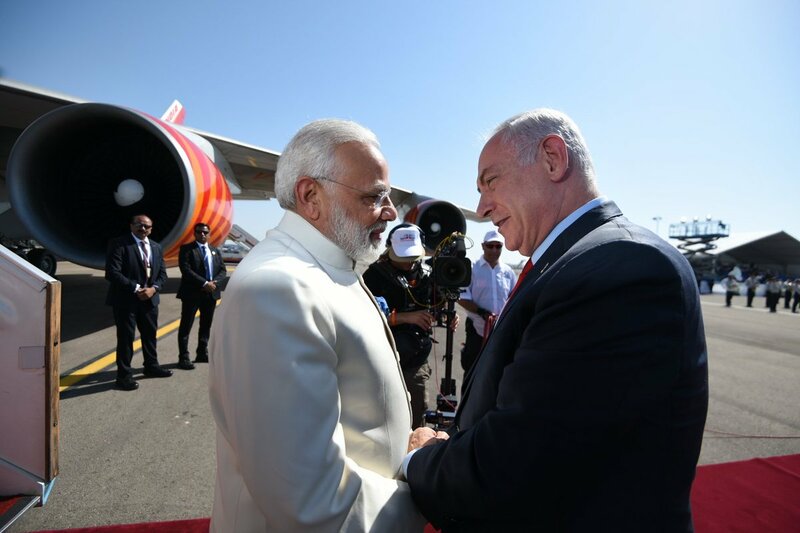 Mr Modi touched down at Ben-Gurion airport to begin a historic visit to Israel that promises to put India-Israel relations on a higher plane than ever. 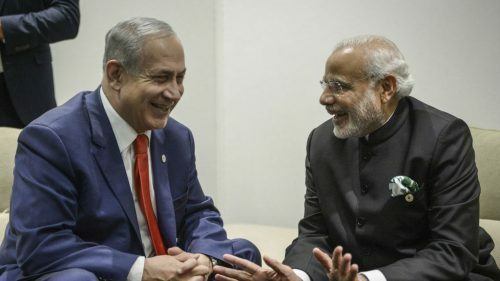 Hugging the Indian leader, a beaming Netanyahu, alluding to what Mr Modi told him in his first meeting in New York on the sidelines of the UNGA in September 2014, raised the bar, saying not even the sky is the limit for India-Israel relations. In a unique gesture, the Israeli leader was present, along with his senior ministers, to welcome Mr Modi, the first-ever visit by an Indian prime minister to Israel. JERUSLAEM/TEL AVIV: In a transformational moment for India-Israel relations, Jerusalem has launched an all-out charm-offensive to roll out the red carpet for Prime Minister Narendra Modi, the first-Indian leader to visit the Jewish nation. 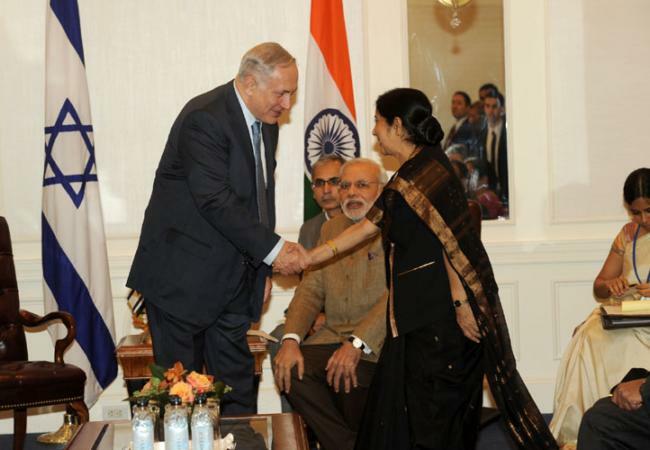 In resonant gestures that will underscore the unique and special character of the expanding India-Israel relations, Israeli Prime Minister Benjamin Netanyahu will not only personally receive the Indian leader at the Ben Gurion Airport in Tel Aviv, but will also accompany him to nearly all the events and functions connected to the prime ministerial visit. There will be concrete deliverables and substantive outcomes after talks between PM Modi and his Israeli counterpart Benjamin Netanyahu in Jerusalem on July 5. Many key agreements in areas of agriculture, defence and space are expected to be signed, said informed sources. India has unveiled “a new vision” for forging an innovation-focused partnership with Israel, and sought Tel Aviv’s support in key programmes of national renewal, including Make in India, Digital India, Smart Cities and Clean Ganga. 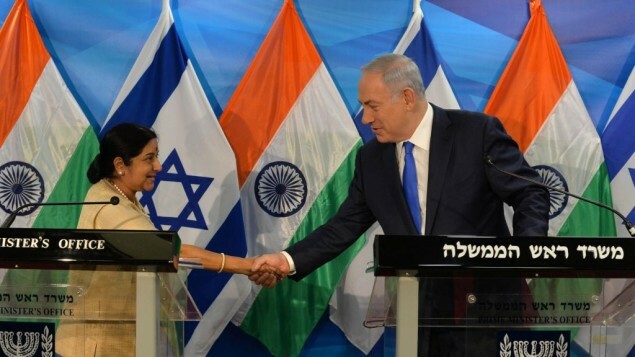 In a delicate diplomatic waltz, India will seek to balance its burgeoning ties with Israel with a forceful reiteration of its commitment to the Palestinian cause during External Affairs Minister Sushma Swaraj’s visit to the West Asia region.